August is my favorite month. OK, so there’s my birthday on the 24th. And several dear friends have birthdays close by. And of course sweet corn, tomatoes and peaches – all my favorites! But the real reason it holds such a special spot in my heart is the mighty Marching Vikings. I spent five years of dewy August mornings learning the four halftime shows the band would perform for the ten regular season football games that fall. There was no post season for the Jewett-Scio Vikings. Our record for my entire high school tenure was 0-39-1, the one tie coming on our Homecoming game my Senior year against Conotton Valley, a neighboring school about half our size. Since I graduated with a class of 59 students, you can imagine this wasn’t exactly the Clash of the Titans. But we managed to tie Conotton Valley, and anyone witnessing the celebration that ensued would have thought we’d won the Ohio state championship. So our football team sucked, but the marching band ROCKED! We were a “show” band, as opposed to a “competition” band, meaning we did four different halftime routines, plus a variation on one of them for the Homecoming halftime. “Competition” bands learned ONE show and drilled it to perfection, then took it on the road to marching band competitions looking for trophies of their own. We only ever entered one band competition in my marching band career, and that one only as an Exhibition entry, meaning we weren’t really competing, but we did get the judges’ comment sheets and taped commentary. We did really well (did I mention that we ROCKED? ), but our band director, Mr. Kovarich–or Mr. K as we called him–had no interest in going that route. He wanted to entertain the fans, and he didn’t want to bore them with the same competition show week after week. I think Mr. K might have been out of his element, having no experience with drum & bugle corps style directing, with their stationary drum lines, a drum major/conductor, rifles AND flags, and incredibly intricate field formations. We only had majorettes (who Mr. K doted on) and flag girls (an element Mr. K didn’t much care for at first, but which grew on him). And we wowed the crowd with such themed shows as our famous Donna Summer Show–featuring Hot Stuff (wait for it – 4:10 in! ), On The Radio and Enough Is Enough/No More Tears! Given the laughable J-S football record, being in marching band was a badge of honor. In other schools, the ‘band geek’ moniker stemmed from the being on the sidelines of the glory of the football field. Not so at Jewatt-Scio. There, folks would head to the concession stand during the 2nd quarter so they could enjoy their hot dog and hot chocolate while the Marching Vikings strutted their stuff! The Jewett-Scio Vikings Alumni Band – still proud, still fierce! Mr. K was a huge favorite amongst the band members, many of whom spent most study halls in the band room “practicing,” which was a euphemism for playing Hearts. And he maintained an incredibly strong J-S Band Booster parent organization which kept us in spiffy uniforms and instruments, no mean feat (although made easier by the fact the the band was the only reliable high point of any Friday night in the fall.) But Mr. K wasn’t looking for new challenges. He was heading for retirement as soon as he could draw a full pension, and managing a competition band was more work at a time he was looking for less. And let’s face it, going to competitions takes a lot of money. Maybe Mr. K though it best to use the Booster’s limited resources to entertain the fans at home. And so we ROCKED–and still do! Still, it’s a pity that our amazing Marching Vikings, who were soooo much better than the on-field Vikings, didn’t get the chance to bring home glory to Jewett-Scio High. Perfect for pickles and scallions ~ no swirling through the marinade to snag that last pickle! Good time, good times. But isn’t this a food blog, you ask? Why yes it is, and by way of (lame) segue, August also has the distinction of being tomato, sweet corn, cucumber and peach month–all my favorites. Back on the farm, those weeks in August saw our plates loaded with corn plucked and husked while the water came to a boil and tomatoes still warm from the sun as Mom sliced those beefy thick slices. And in the fridge, two items were a constant presence–scallions in ice water and a simple tangy-sweet refrigerator pickle, both in a special Tupperware containers designed just to store and serve them. These pickles weren’t cooked, so the freshness of the cucumber was still vibrant through the tangy-sweet marinade. Years later, I would be served a similar pickle in Japanese restaurants and it took me back to pretty much any supper in August on our farm. I’ve since revived this summertime tradition, adding a tiny bit of Asian influence to my Mom’s technique. Keep these in your fridge for the perfect refreshing accompaniment to August corn and tomatoes alongside ANYTHING off the grill! 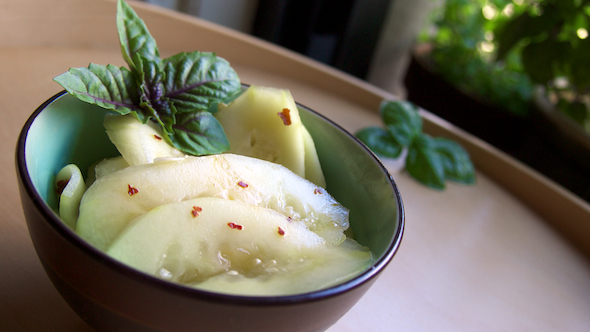 Slice the cucumber into thin medallions. Set a mesh strainer over a bowl. layer the cucumber slices, salting each layer. Let stand for 10 minutes. toss the slices with your hand to mix things up. Let stand for another 5-10 minutes. Rinse the cucumbers well and allow to drain. In a wide mouth container with a tight fitting lid, combine the vinegars, sugar, red pepper, 2 pinches of salt, 1 pinch of pepper, the pressed garlic and the sesame oil. Shake to combine. 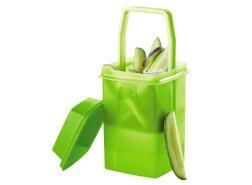 Add the drained cucumber slices to the container, add the lid and shake gently to combine. Refrigerate for 2 hours before eating. These keep nicely in the fridge for a week. When you’re done with this batch, you can add another smaller cucumber to the remaining liquid for a second go around. Feel free to adjust the spiciness – we like a little more kick, so I add another garlic clove and more red pepper oil, along with a tad more sugar. New York notes about hometown memories! Good Read!